NeverSeconds: Yesterday is now today! Great to hear from NAYK and the safe return of Not a Hippy from his quests. Food looks wonderful as always, although I can only eat very mild curries myself (also without meat). Hope they have fun with the Queen and the weather stays good for sports day. Looking forward to the next food posting - does that mean we get additional posts today? Wow, that looks lovely. You should post your school recipes! Your school sounds wonderful and can't wait to hear about the Queen's visit and your next meal! I still don't believe a child gave that description of the food, not without being told. The whole point in this blog is for a child's perspective of their school meals, not to write what an adult has told them to write. Please re-read this particular blog from the beginning and then use the link below to find out a little more of how this type of school works, as it is different. Enjoy the combined comments from the boys for this particular meal - and it really doesn't matter that it has been typed up by an adult. Did you not read this bit ?
" I (Not a yoghurt knitter) work at our school as a teaching assistant. " Have already read the blog from the beginning. After all the exposure NS got it would be a shame it being ruined by an adult doing the reviews or telling what the kids to say. It's obvious this weeks guest blogger is an adult advertising the steiner waldorf education system. VEG built this blog up as a girl's dairy of her school dinners and her thoughts about them. It would be very sad if the reputation she has built around the world on this blog is destroyed by an adult writing the blog or at the least informing the child what to write. Sorry NAYK but I won't be reading again till next monday when we have a new guest blogger. I don't want to read propaganda for the Steiner Waldorf education system or words that a student there is told to write. Bring back VEG and BLOD! Solaaris, it seems the toys have been thrown from the pram on this occasion and why blight a young child's blog with your rant. Thanks to Veg, we will have the opportunity as Parents over the coming weeks and months to interact, learn and see lunches from different cultures/schools from around this ever smaller world. Why not have a little bit about the school, it's philosophies and a bit of propaganda as I for one don't know how a Dharma School differs from a Cheder school. I sincerely hope Solaaris, that you will continue to read this weeks blog entries, join in and learn. We do not know the types of schools this is going to but there is a diverse selection out there in this world that may wish to guest blog. Some will have different beliefs to our own, we should embrace that with a positive attitude, if not for us but for our children. Once again this is disappointingly written by an adult and not a child. When will Not a Hippy get a chance to write their own post? Back on topic re: food. Do you get a choice to have the cake without cream? I prefer plain cake personally. 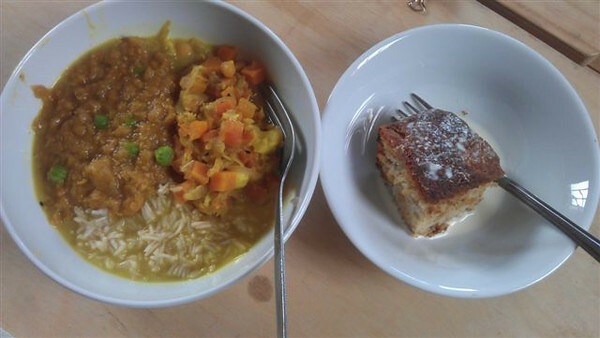 The lentil dhal looks a bit sloppy and rice a bit soggy but the cauliflower and carrot curry on the side looks really nice. You mentioned yesterday that the food is the same each week. Does this change each term or is it always the same 5 meals on a rota? Thank you for pitching in while NAH has been off on maneuvers. I can practically smell the dhal and the curry from here, yummy! I have seen pictures of the Queen with wellies on, but only at Balmoral or in a stables. I imagine they'll keep her out of the bogs for the visit. I look forward to NAH's report of the goings on. I have to say... whoever this person is writing (Not a Yogurt Knitter?) is confusing the ***** out of me. Creative writing is good, for creative writing classes, or maybe fictional novels. But on a blog, there is a limit before it becomes a headache. I had to reread Monday's post about 5 times before I could make sense of it. And todays... well I think I might take a vacation from reading until Veg gets back. Why is a teaching assistant talking about a 15-year old as someone she "supports most of the time"? Are you his mother or his teacher and you somehow support him? I also did not like the promotion of the school so much, which it kind of sounded like the writer was doing. This is a blog about childrens' perspective on their school lunches. Not so much this week. "The children at the Steiner school are not exposed to working with computers until they get in to the upper school, I think the hunt for the location will be a warm up game later in the week." My eldest daughter had a young boy in her class (throughout school) who had trisomy 21. This very bright and kind young lad had a one to one teaching assistant support him daily at school. The class also had another teaching assistant that was multi lingual. The teacher and both the teaching assistants were also able to sign. My daughter often came home excited because they were taught sign language so they could communicate with the deaf child in her class. I find I must agree with "Princess." "The children at the Steiner school are not exposed to working with computers until they get in to the upper school, I think the hunt for the location will be a warm up game later in the week" left me with the exact same questions. That sentence is utter gibberish. And these blog entries sound much more like unpaid advertisements for the school than school-lunch reviews, whether written either by a student or teaching assistant. Considering the strangely confusing writing, as well as the rather simple spelling errors, I'd definitely NOT be tempted to send my children to this kind of school. In addition, given the role electronic technology plays in the world we live in today (which is why most schools start teaching at least keyboarding in early primary grades), I wouldn't send my children to a school that didn't start teaching "computers" until "upper school." My children happily "hunted dragons" after school, on weekends and during school holidays. I sent them to school to actually LEARN things they would need to become functional, contributing members of society. This "school" sounds far more like a pre-school or early primary day-camp than a school. One of the things I've enjoyed about reading the comments here is reading the posts written by people with other languages as their native tongue. I tend to smile when I read their apologies for their English and think, "You speak far better English than I do ____________." And I am thrilled that school children in Wales receive instruction in their native language, thereby keeping it alive. But I'm appalled by this example of "creative writing" by someone who is, I presume, responsible for helping children learn. You can't teach what you don't know yourself. I’ll keep checking in occasionally this week to see if Veg or Veg-Dad has written anything. But I’m not reading any more advertisements for the Steiner school. I’ll wait for the blog to travel to Texas. As someone who (unfortunately) often doesn't seem to know when to leave well enough alone, I had a few other thoughts after I wrote my comment. 1) If "Not A Hippy" is actually a 15-year old boy, based on my experience, he'd probably be at least starting to develop an interest in girls but well past the age of wanting to go "dragon hunting." 3) Interesting that "O" and "Z" only chose to give this day's lunch a 5 out of 10 on the Food-O-Meter scale, yet Yoghurt Knitter insists that "the food is SO tasty..." (The meal, by the way, that she claims is her favourite.) Too bad Yoghurt Knitter didn't let the children speak for themselves about how they felt about their lunch. 4) Lastly, what does "so healthy today is tie the duvet down Tuesday" mean? I Googled "expression tie the duvet down" and all I came up with were suggestions for keeping a duvet from bunching up in a duvet cover. Is that a British expression of some sort, or just more of Yoghurt Knitter's jibberish? I could be wrong but I was under the impression that Not A Hippy was a special needs student of some type. And the paragraph that confuses you so much made perfect sense to me. VEG hunts for the location of the guest meals with her Dad on the globe. So NAYK was referring to that exercise stating that they would use it as a warm up activity for the entire class to make it more interactive. As far as the tone and the way that the Steiner school is spoken about, it seems as if the writer is used to taking a defensive attitude about that type of school and was trying to preempt your type of response by educating the reader. It's really a shame that so many people have reacted negatively. This is not life or death, it's a fun educational blog and VEG and her Dad are working hard to fill the vacation months with different opinions and varied schools from around the world. To everyone involved thank you for all your hard work and participation. I adore reading VEG's accounts of her school meals and adventures. I also enjoy seeing different perspectives from around the globe. Really not enjoying the "superior" tone of this weeks blog. It's a shame because NeverSeconds is on my daily must check list. Might give it a rest until Monday, I love Japan so can't wait to read what they have to say. I think all of the blogging has been fantastic! The world is made up of all sorts and that's one of the great things about this blog! Quite enjoying vegetarian week, although I've never been a fan of cauliflower! I'm sad to see so many negative comments on this post. Writing a blog is a fairly organic thing, you never know where it's going to take you. You meet new people, explore new things. There is no set way to do it. I think it has been fabulous reading about the different types of schools, different foods, different cultures. This is a blog of many voices, and they don't all have to be children's voices. I've learned something new from each and every post, and seen the interesting differences and similarities as to how I grew up. To VEG and guest bloggers: Don't let the trolls get you down. They're no better than the people who told you to stop photographing your meals. Carry on proudly! You guys are doing a super super great job! Excuse me I ain't no troll! However I agree as I wrote further up that this weeks guest blogger is mainly doing free advertising than a childs food review from his school. I love reading Veg's blog but this weeks write is not so good. "what does "so healthy today is tie the duvet down Tuesday" mean?" It took me this long to figure it out (not the brightest candle in the chandelier, am I?) but it finally dawned on me.